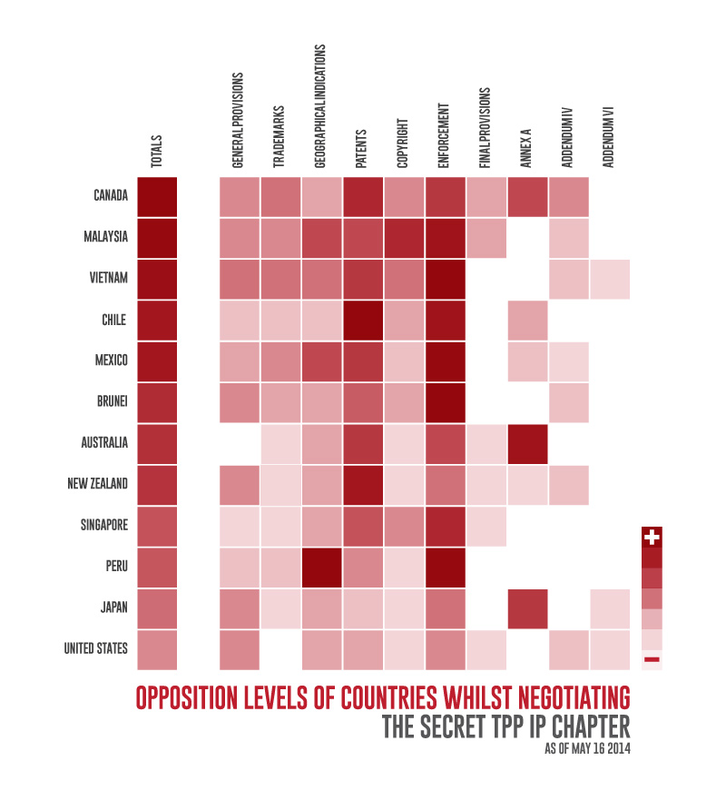 In fact, Wikileaks compiled the following graphic that shows Canada as the strongest opponent to TPP IP demands, signalling its opposition to a proposal 56 times, more than any other country. The strongest opposition comes in the patents, enforcement, trademarks, and copyright sections. Why is Canada opposing so many U.S. demands? Simply put, the U.S. wants Canada to eviscerate many of the recent reforms found in copyright and counterfeiting legislation along with court rulings on patent protection. These demands focus on enhanced criminal liability for copyright infringement, eliminating the Canadian approach to Internet service provider liability, extending the term of copyright protection, and expanding patent protection. Canadian negotiators have thus far resisted many of the proposed changes, offering alternatives that are compatible with current law. Yet as the treaty negotiations continue, the pressure to cave to U.S. pressure will no doubt increase, raising serious concerns about whether the TPP will force the Canadian government to overhaul recently enacted legislation that it has steadfastly defended as reflecting a balanced, “made in Canada” approach. the world’s largest land-grab goes on. What submarine’ed clause allows ‘orphan works’ data collection and a 15 yr court case to settle disputes? Mr. Harper is acting like a child who has been shunned by the bigger kids and thinks he can create his own path by being non compliant and non cooperative. As a result he is not gaining power or “getting even” on the world stage, but exercising his stupidity over the Canadians at great cost and shame to our country. He still has a year to really screw things up. If there are any free thinkers in the conservative party they could help unseat the tyrant. My guess is that Canada is acting as a proxy for China. They’ve announced both opposition to the TPP and interest in joining the TPP if it is modified. The Conservative gov’t has shown itself very friendly to China, and my guess is they are helping them get what they want before they join negotiations.